I absolutely loved our wedding and would love to share it with you! Hope you enjoy seeing our theme, our DIY decor, and the wonderful people who made our day so special! I could go on and on about every little detail because it was such an incredible experience, but I'll try to spare you the blabber and share mostly pictures. Maybe they'll inspire some of your own DIY wedding details! 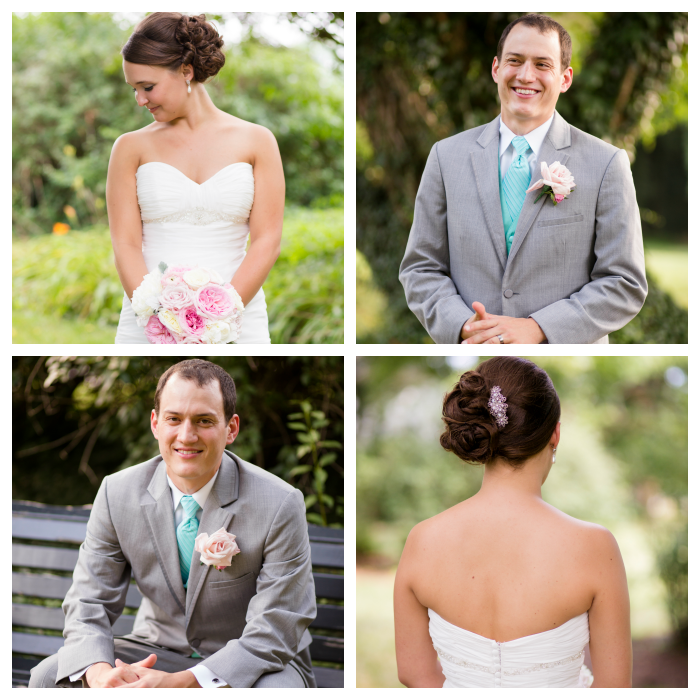 Also check out my Pinterest wedding board for some pictures that inspired my colors and theme! 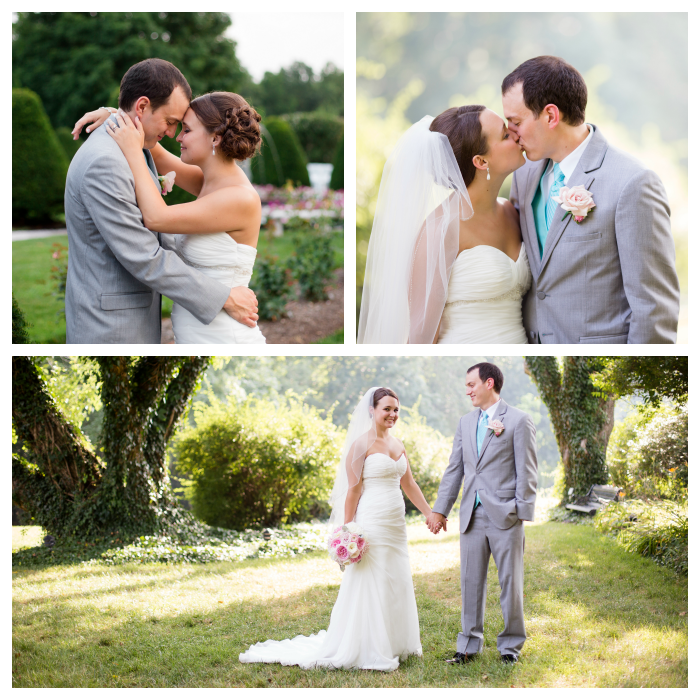 All photos on this post were taken by our amazing photographer, Anna Kerns. 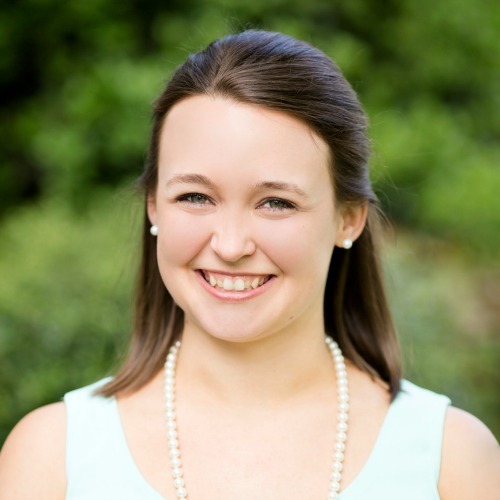 I can't speak highly enough of her, so if you're in the MD/DC area, check her out! 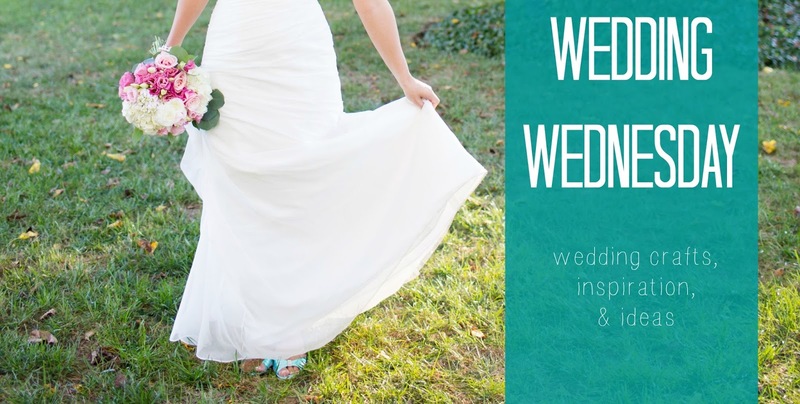 Have you checked out my Wedding Wednesday series? Check out all of my DIY wedding projects below! Affiliate links included for your convenience. See my disclosure policy. The venue we chose was Antrim 1844. We couldn't be happier about that decision. Antrim is a beautiful bed and breakfast. The rose garden where we held the ceremony is stunning all on its own. The food is amazing. The staff is incredible. We really felt like royalty during our time at Antrim. My wedding dress was from Casablanca Bridal's Fall 2011 collection, style #2049 (for some reason their site is not working, so I can't link to it. Sorry!). Shoes are Touch Ups "Asher" which were purchased from and dyed by Scher's Bridal Shop in Pocomoke, MD (they are absolutely wonderful to work with!). The silver bracelet I bought on clearance at Macy's and the pearl bracelet I made myself with faux pearls from a local craft store. The hair comb is another DIY. I bought a plain comb at a craft store and added embellishments to match my jewelry using super glue! The earrings were purchased on Etsy from Be Yourself Jewelry. She also made gorgeous earrings and necklaces for my bridesmaids. 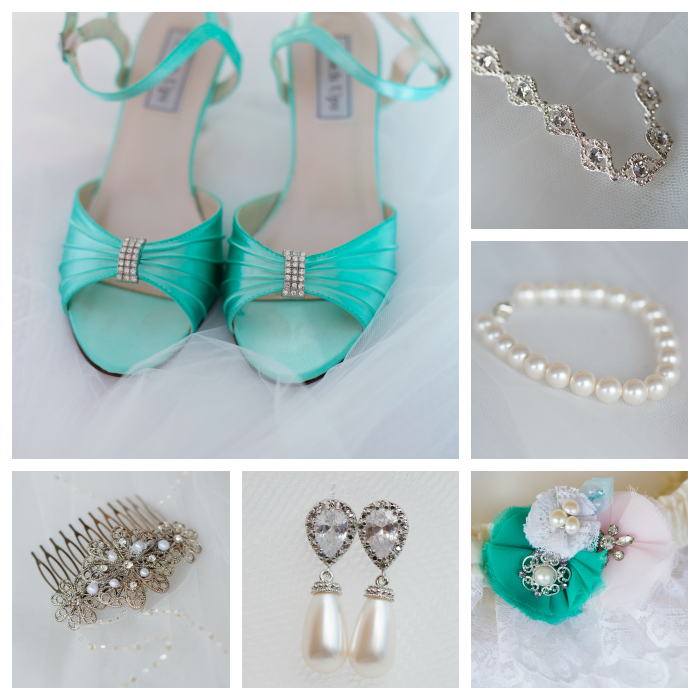 The garter was made by my mom with lace, satin, and pearl buttons from her own wedding dress! I absolutely love my engagement ring! And he picked it out all by himself! Brownie points for Pete!! My engagement ring is a Scott Kay "Artiste" purchased from Helzberg. His wedding band was also purchased from Helzberg. My wedding band is a Jeff Cooper design purchased from Mervis. 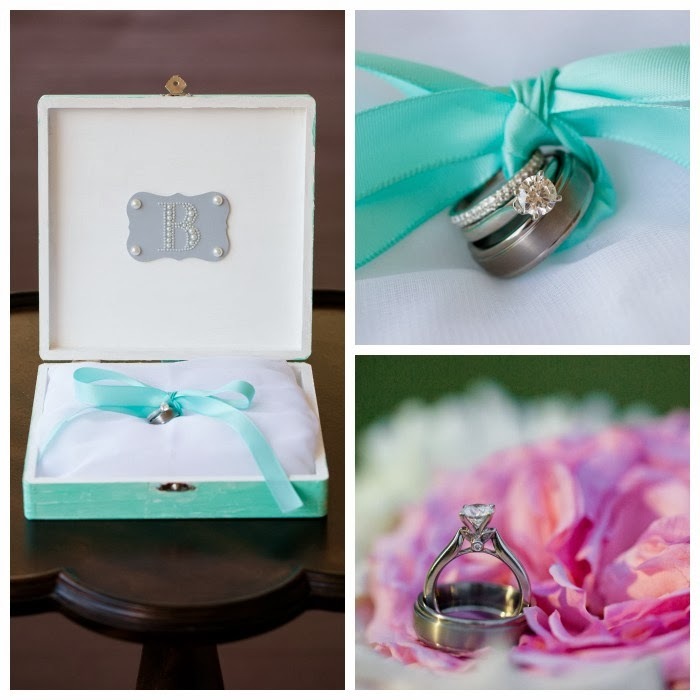 The box holding the rings was created by myself, my sister, and one of my bridesmaids! 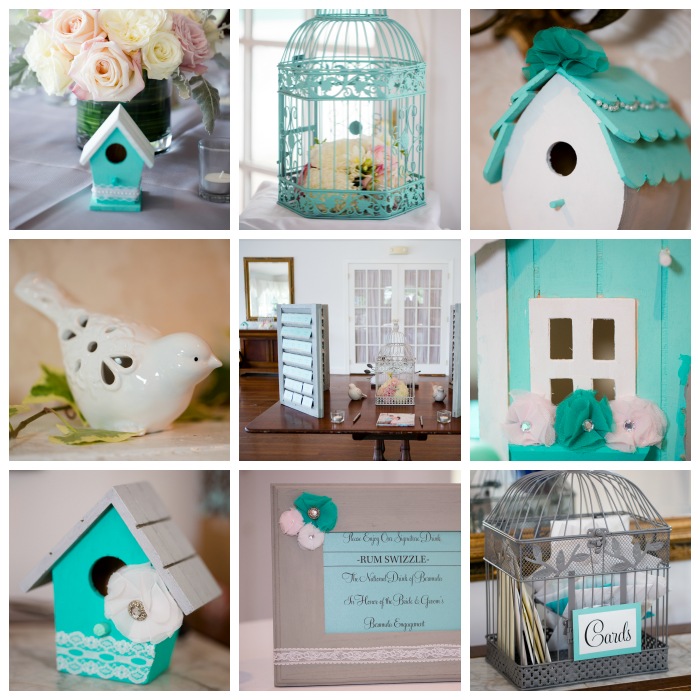 We used a bird theme with my favorite colors, teal (I never know what to call it... teal/turquoise/mint/aqua... love them all!) and grey of course! 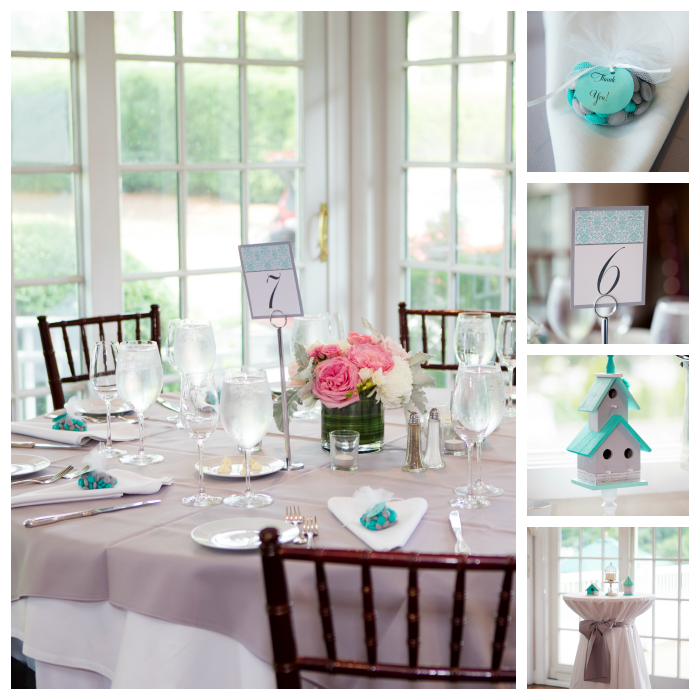 We decorated little bird houses with paint, lace, and DIY chiffon flowers to place on every table. We spray painted bird cages in our colors. We collected little ceramic birds for months! For favors we used custom colored M&M's which we placed in tulle bags tied with ribbons and "Thank You" tags we made ourselves. The table numbers were made by Citlali Creativo. We made several signs as well. The one pictured is a sign for our signature drink, the rum swizzle. It's the drink of Bermuda which is where Pete proposed! The cake was made by Just Desserts by Linda. 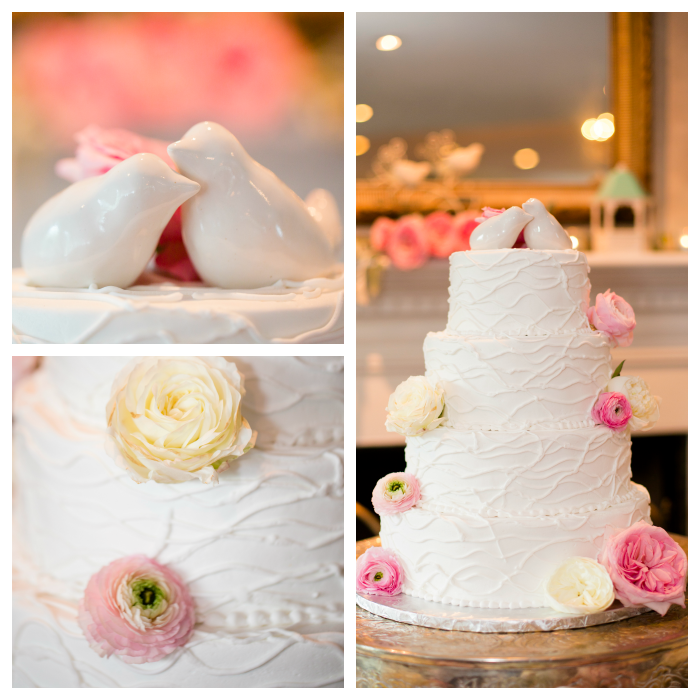 She does beautiful work and makes delicious cakes! Love my girls! The bridesmaids were my sister, Pete's three sisters, and two of my best friends. Love them all bunches!!! Their dresses were Impression Bridal's 2013 collection, style #20016 in the color "sea mist." The flower girls (Pete's nieces... now mine too!) dresses were from Flowergirldressforless.com in style #355. I removed the flower that came with the dress and added chiffon flowers that we made to match the bridesmaids dress color. We also made the buckets for their bouquets. Aren't my flower girls just so adorable!!!! The dudes in Pete's life. The groomsmen were our three brother-in-laws and three of Pete's best friends. Every one of these guys thinks they are a comedian, so it made for a really comical day! The ring bearer is Pete's nephew. He's too cute!! The ushers are my two little brothers and my best friend since middle school! The guys all wore tuxes from Jim's Formal Wear with vests and ties in the color "mermaid." The most handsome guys around!! Hi! I came for the party and got a wedding! lol :) Seriously though, I saw the Wedding tab and clicked to see what is was about. My fav color is teal too and you picked a lovely shade of it! Congrats and best wishes! Now to the party and thank you for hosting the shindig!! Ciao! 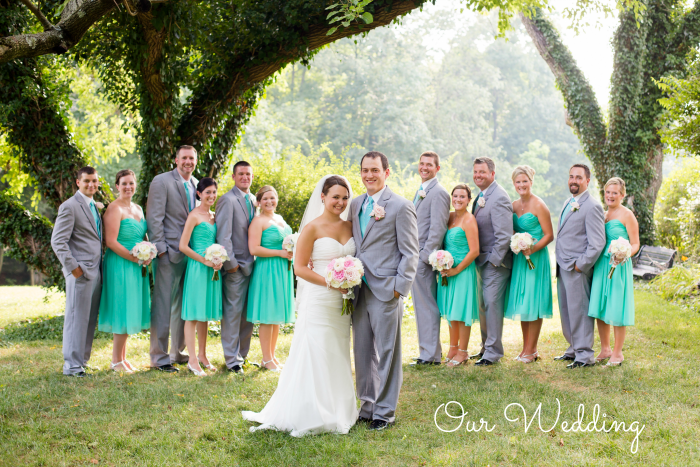 Loved your wedding colors, Nicole! And the pictures are gorgeous. Random question, where did you get the robes for you and your bridesmaids? My younger sister is getting married in November and she's looking for robes exactly like that!